6 Best Occasions to send Fresh Flowers with Cake!! Flowers with cake make one of the most lovely gift combos. Flowers appear refreshing and visually alluring. They change the mood and uplift the temperament of the onlooker instantly. Beautifully decorated cakes not only taste yummy but also appear visually tempting as well. The super hit combo of flower with cake never fails to impress our loved ones. Flowers symbolises ephemeral beauty and pleasing fragrance. Thought real flowers last for only few days but they have a lasting positive impact on the recipient. Each types of blooms symbolises different meaning and emotions. Flowers & cake are all occasional gifts. You can also get cake and flower delivery in India at desired locations at online gifts stores. These useful portals offer various kinds of seasonal and exotic flowers delivery in India without any hassles. Online portals also offer flowers with additional gifts like cakes, chocolates, dry fruits and sweets. There are many wonderful occasions and festivals when you can gift flowers along with cake to someone special. Birthday party celebration is incomplete without gourmet B’Day cakes. Fresh flowers add liveliness and freshness onto the celebration. Thus, it would be an amazing gift choice to send flowers with delicious cakes in awesome flavour. Send birthday flowers online for your friends, family and dear ones. Buy different flavours of birthday cakes online like chocolate cake, pineapple vanilla cake, butter scotch cake, strawberry cake and black forest in various quantities. A flower basket arrangement along with delicious cake can convey wonderful anniversary wishes to spouse or friend on their wedding anniversary. Some popular choices of anniversary blooms are roses, orchids, colourful bunch of gerbera and pink lilies. You can also choose to deliver flower in glass vase arrangements and Red velvet cake for the special couple. Online store offers amazing collection of anniversary flowers and gifts for 1st, 5th, 10th, 25th and 50th marriage anniversary celebration. Christmas is the time of the year to get united with loved ones and celebrate the birthday of Lord Jesus. This festival also teaches us to thank & appreciate each & every person in our lives. Christmas festival in India is celebrated during winters. Thus you can send warm winter blossoms to your loved ones. Flowers stand for gratitude, admiration and affection as well. Xmas celebration is known for mouth watering plum cakes, generously filled with dried fruits, raisins & nuts. Send flowers & cake for Christmas in India via online stores. All of us know that Christmas celebration is followed by New Year. We enter into the last phase of the year and enthusiastically anticipate for the coming year. Most of us like to party and celebrate New Year. You can use fresh flowers and long stem blooms, floral arrangements for decorating the venue. Start the year on a sweeter note by cutting New Year cake with loved ones. Valentine’s Day i.e. 14th of February is a much awaited day every year for couples who are in relationship. Whether they are married or bachelor, every couple want to surprise their partner with amazing V-day gift. Flowers give us so many charming choices to impress spouse and girlfriend/boyfriend. Romantic Red roses tied in form of a bunch, or arranged in a designer bouquet /basket would go perfectly well with the romantic festival. Also explore online cakes for your gourmet partner. 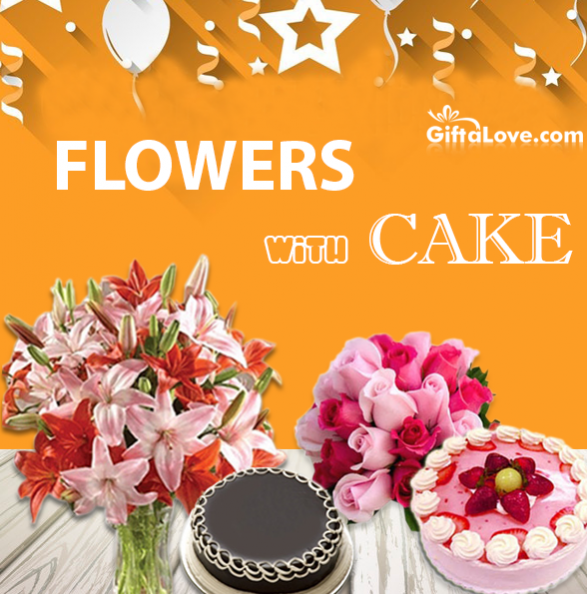 Well if your friend (or any other dear one) is angry on you, send flowers with delicious cakes ( www.giftalove.com/flowers-with-cake ) to cool down their anger. Fresh flowers look enticing and eye catchy. Thus the onlooker can no longer in a bad mood. Tasty cake will remove the bitterness in the relationship. Thereby flowers and cake also make wonderful Sorry gifts. You just need to select the right kind of blossoms and their favourite cake flavours for impressing them. So these are six wonderful occasions and special events in life, when you can get flowers & cake delivery. Log on to Giftalove.com has explore broad array of flowers, blooms by numbers, long stem pristine flowers & designer bouquets for all occasion. This website also offers best collection of premium cakes online for every festival & occasion.